PORT OF SPAIN, Trinidad and Tobago – The platform for the BP Trinidad and Tobago-operated Juniper gas project is on its way for installation 50 mi (80 km) offshore. 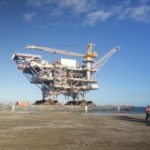 The Juniper project comprises a platform made up of jacket, piles, and topsides, and corresponding subsea infrastructure which will be installed in 360 ft (110 m) of water. The Juniper facility will take gas from the Corallita and Lantana fields. The platform installation is being handled by the Thialf, the largest deepwater construction vessel operated by Heerema Marine Contractors. The Diamond Ocean Victory semisubmersible rig began drilling the five subsea wells in May 2015. First gas is expected this year. The Juniper project is a $2-billion investment in Trinidad and Tobago and one of BP’s largest start-up projects in 2017.